Generation C (for Connected) is the name given to digital natives, the people who feel comfortable in the digital world, own lots of mobile devices, and tend to use at least two at once. Members of Generation C are better informed and more demanding, increasingly mobile, ubiquitously connected, and amazingly social. And they desire to be in control of their own lives. Channels are a thing of the past. Channels have always been an internal construct, but with Generation C, channels are meaningless. Generation C moves seamlessly from device to device, and they expect you to do the same. A conversation with customer service started in chat may move to Facebook and then to a phone call. Your customer service organization needs to provide a consistent experience across all channels and must be able to transition smoothly between them. Bad news travels fast: In the good old days, an unhappy customer would tell ten friends. Today, a disgruntled customer won’t hesitate to tweet about a bad experience to her million (or more) followers. Keeping customers happy – especially the ones that influence large communities – is more important than ever. Consumer in control: You are no longer the only one broadcasting messages about your brand. Generation C is having conversations about your brand that you cannot control – all over social media. With Generation C, you need to know what’s going on at all times and be ready to move quickly to protect or enhance your brand. And you’ve got to convert all the information available to you – from outside and inside the enterprise – into purchases and transactions. That brands have lost control over what’s being said about them is nothing new… it’s a trend that was born with social networks. So today, just as smart individuals work hard to manage their online appearance to people they don’t know, or potentially wish to impress, so must smart businesses – just on a much larger scale. ‘Keeping customers happy – especially the ones that influence large communities – is more important than ever’. Indeed, these days it’s vital to reach out to these people (especially bloggers) and charm them, making them an essential part of the conversation about your destination. Every business and destination has to assume that it’s serving not only the individual on the other side of the counter, but potentially millions of that individual’s followers too. So keeping customers happy, and dealing with complaints across a wide range of channels in real time will take smart management and real effort. It’s also a 24/7 job; savvy hotels are already conversing with their own guests who tweet comments from their bed after check-in. respect for fusty opening hours of helplines or bureaucratic hurdles in claiming refunds or making complaints. Gen C is the first generation to have grown up permanently-connected, and so is much more comfortable with the idea of sharing what was previously regarded as personal data online. This means that customer conversations will increasingly take place through Twitter, Facebook or other social networks. A good start on this road has been made by KLM Royal Dutch Airlines, already famous for its social media marketing campaigns. 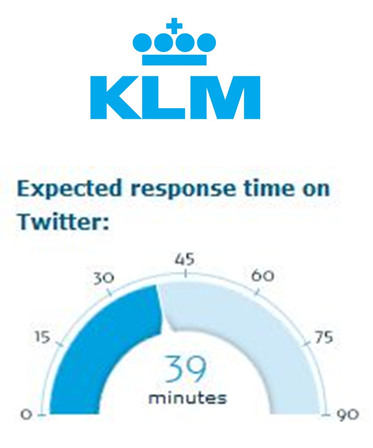 Today the airline uses both Twitter and Facebook to chat directly with its customers about specific issues (via private messages), whether on flight prices, lost baggage or quirky requests, always promising to respond to questions within one hour. It offers this service 24 hours 7 days a week and in 10 languages. This helps to demonstrate how social media has helped remove the traditional limitations to customer service (basing a call centre in each region or country, limited opening hours per time zone). As one commentator put it in response to the above article, the need to switch seamlessly across all channels becomes even more vital if Gen C form the largest part of your client base. So how long will it be before submitting baggage claims by post or phoning to book a flight will be regarded rather like paying for something by cheque – as a rather long-winded and quaint thing of the past? What’s your take? What implications will the rise of Gen C have on customer service for businesses in the travel and tourism industry?